A few readers noted that while the mathematics of compounding make sense, it's not motivational for those too old to take advantage of its full force. “This is pretty depressing for those of us who spent our 20s with practically no income thanks to universities,” wrote one commenter. Her sentiments were echoed by several others. It's important to note that saving is not the only smart thing you can do with your money. Your education is an investment, too. Yes, you should begin to save as soon as possible, but there are other good options, too. My friend Joel is in medical school. I haven't talked to him about his personal finances, but I doubt he has much saved right now. He lives a frugal lifestyle, but that's out of necessity. He doesn't have an income that allows him to splurge or to save. But Joel is obtaining an education that will pay dividends in the future. He'll leave school with huge debt, but he'll also have tremendous earning power. And he loves his work. There are times when it makes sense not to save. Save when you can, but don't sacrifice your happiness or your future to fully fund your Roth IRA. What if you didn't start saving when you were young? What if you could have saved, but opted not to? What if, like me, you find yourself approaching 40 with the bare minimum of retirement savings. What should you do? First, don't beat yourself up over the past. There's no sense fretting over choices you made when you didn't know better. Do I wish that I'd saved for retirement instead of buying comic books and computer games? Absolutely. But what's done is done. Instead, structure your present so that it matches your priorities. If you've decided that saving is important, that you want to put your money to work in the stock market, then make moves in that direction. Open a Roth IRA. Set aside $50 or $100 or $200 a month. If you look at your current situation and still don't think you can save for retirement, that's fine. Sometimes other things take priority. When you're choosing between funding a Roth IRA and attending university, both are excellent options. (I would prefer the education.) But when you're choosing between a Roth IRA and a new car, I believe saving for retirement is almost always the right choice. Be conscious of the trade-offs you're making. You can't have everything. Finally, set goals for the future. The road to wealth is paved with goals — they are the fundamental building blocks of success. When you know what it is you're trying to achieve, you can steer your life (and your finances) in that direction. If you didn't start saving when you were young, don't panic. Examine your priorities. Set goals. Structure your finances to reflect what it is you hope to get out of life. Saving is important — and you should begin as soon as possible — but it's not the only component of personal finance. Whenever I feel bad about my financial situation, I remind myself that money isn't everything. It's only one part of the Big Picture. I'm actively working to improve my relationship with money, and that's what matters. There is no one right answer. Do what works for you. There are 30 reader responses to "What If You Didn’t Start Saving Early? Advice for Late Bloomers". J.D., as a direct result of your previous post about compound interest, I starting considering what I would do with my extra cash after I’ve paid off my CC debt (September!) Instead of throwing the entire amount at my student loan debt (most of which is in deferral at the moment) or at my second mortgage, I’m thinking about increasing my 403b to 10% and another 10% to a Roth IRA (until it’s maxed). I’m trying to learn about the best mix of equities to make my money grow even more quickly. I feel like I need to take better advantage of the time I have left to retirement (20 years) and work less aggressively on the mortgage/student loan repayment at this point (without forgetting that I have a goal of debt-free living). Just to expand on that for a bit — putting your money anywhere but a savings account (aside from requiring a certain level of cash on hand for purchases/emergencies) makes a lot of sense. Reason being – if you keep your money in a low yield savings account, you’re actually LOSING money each year due to inflation. Let’s say inflation is at 2% (historical, long-term average) and your savings account is yielding 1%, then you’re losing $1 for every $100 in the account each year…crazy, huh? With many lamenting about how school or student loans make it hard to invest early in life, that does say that people should starting thinking about this even earlier. High is the time to decide what educations are worth the money and what you can do do decrease the cost. Perhaps it’s AP exams or community college. Or it’s studying extra hard to get scholarships. Or it’s picking the local state university. Or perhaps it’s taking 6 years instead of 4 so you can work more hours. Unfortunately, expecting inexperienced 15-16 year olds to be able to make a smart decisions is unrealistic — and there’s certainly no way you can send a message back in time to yourself. So all you can do is do the best you can and pass on your wisdom to your kids so they don’t miss their opportunities. I’m in my early 20’s and I am aggressively funding for retirement. Sometimes I feel almost obsessed with it. I’ve learned to step back and look at the big picture of life. Things like being with my family and friends, doing activities I enjoy, and being in good health should always be as, if not more important than money. I think that the equation that you give for happiness hits the nail right in the head. You need all of them to reach your full potential of happiness. I started late too…at the age of 36. In my twenties I just wasted it all away. My mum and dad were frugal, always reminded me of savings but I did not see the big picture. I had a college degree by 24, started working and earning higher than anyone around me….but where is all that money? I have no clue. I did not even invest in a house or a car. They paid for my car as a graduation gift, so this meant I had no sense of value for money. I asked myself a question all the time…had I been that stupid?, despite getting a college degree? Regret is always there, but now I learnt to forgive myself and move on. Reality hits at the age of 33. But I am glad because when it hit me, it hit me hard. I am now able to save at an accelerated way. I invested in a higher degree and now my earning capacity allows me to save 2000-2500 a month. I think each of us will learn our lessons one day, some earlier and some later. As long as it is not too late…that is fine! One thing I think would help tremendously is if schools started implementing personal finance courses. The only time I ever learned about finance in high school was in a class aimed at personal development, where we were told “if you save now you’ll have more money when you retire”. There were no numbers involved, nothing. Kids need to be taught about finance, and taught early in order to get into the game as soon as possible. I’m 19 years old right now and I’m well aware that when I’m 65, old age security will no longer exist. It’s too bad I’m one of the few members of my generation who understands the importance of saving early and saving big. Great advice. I do think it’s important for those of us in our thirties to quit worrying about the mistakes of the past. Onward and upward! I’m happy that the saving impulse is finally kicking in for me. I agree with Hannah; more serious education efforts can help. With all the bad influences out there, students need to hear the good advice as much as possible! Also keep in mind that no one ever said you have to retire. Until the 20th century, you worked until you died. Both of my parents are capable of retiring now, but I can’t see my mom stopping until she hits 70. Dad? He’ll probably continue to be a professor as long as the university allows him, which will be forever. Those old enough to take centrum silver can also count on social security, I can’t. Wow. I wonder…does that mean that if you have excess amounts of one of the components, you can have less of the others and still be happy? If so, that could explain why some people, who have a strong sense of spirituality but no money, are still happy and content. really, i was just thinking of the immediate numbers in front of me and not how education is an investment in itself. and how it levels the playing field by increasing income potential over one’s lifetime. i know you get good returns on (reasonable) education dollars, but those numbers were still just a little stunning. Vered I think he meant a balance of all of those… and I don’t think there is any doubt that you must have at least a LITTLE of each to be happy. @8, no one says you have to retire, but some times ill health strikes. You want to be prepared to pay your bills even if you’ve had a stroke or been diagnosed with cancer and can’t work. Counting on being ablebodied and working until you die of advanced old age is a very risky strategy. I’ve come to realize that there is cost and risk in every decision. We are forced to make decisions at every turn. We can make them by habit or with our mind. Usually the costs and risks are negligible; sometimes they’re not. Sometimes, the minor things begin to add up, and we need to change our habits or mind to change the direction of our path. Dogma is very popular when giving financial advice, and sometimes we just need a cold fish slap in the face, but I like your site JD because its more about finding our path than giving us walking directions. I had reached the stage in life where due to a relationship break up and loss of my job due to work related injury, I didn’t have much left to fall back on to. That was the catalyst for me to take charge of my own destiny and start pouring all my effort and time into becoming the master of my own destiny. Life is getting better by day. 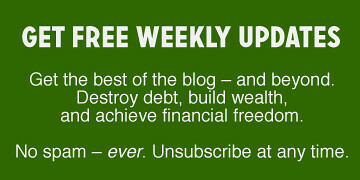 Debt-free living is a reasonable goal for everybody. It can be done if people will maintain reasonable expectations. And I’d have to echo the importance of health. Prepare for future good health just like you’d prepare for a good financial future. PREPARE, PREPARE, PREPARE. And start now! Financial education is the key to position your family for the future. But, I’m not convenced that it is the schools responsibility to teach financial education. Its everyones responsibility to get the financial education they need. Pointing to the schools is shifting the blame. Each one of us is responsible for our financial decisions and should not ask government or schools to provide every need. We are growing more and more reliant of the government to provide our every need – which has created our national debt and put the country in the financial crisis we now face. If someone needs more financial education – then they should go get it. I have to disagree with you on this post, JD. At least in terms of urgency. If you haven’t saved anything when approaching 40, you need to make changes, quickly, or plan on living on crumbs later in life. And by nothing saved, I mean no house equity, no pension, no retirement savings. Consider the numbers… How much cash do you need to pay for your current lifestyle for the next 30 years? For simplicity’s sake, take your current income, and multiply it by 25. Seem overwhelming? Maybe you can live on half your current income. Hmm, that’s still a lot. How about if I live on 10% of what I currently live on? Now think about what you’re willing to give up now so that when it is time for you to stop working, you can afford to feed your dog and your cats (okay, that’s my priority — insert your own favorite critters). If you’re getting a late start, use your 401K ($15.5K for 2008) and IRA (5K for 2008) options to the max. Or at least significantly. It might make things a bit tougher now, but when you’re older and discover you HATEHATEHATE your job, or that young whippersnapper starts making your life miserable, you’ll have options! Oh, and keep your mind and body healthy. More important than a b%$tload of money. I love your site. I’m in my late 30’s and recently purchased my first home. I took out two mortgages (an 80/10) to avoid PMI payments (which at the time were, to my understanding, not tax deductable, but apparently now they are). The 10% loan is not ‘good’ debt – it is a ‘balloon’ loan of 7.9% amortized over 30 years but due in 15 years. This was a fairly stupid loan in retrospect, but there was some confusion that went on with the loan negotiation and the entire home buying process. I’m trying to aggressively pay down this loan so that we can have money for when our son goes to college (which will be around the same time the loan is due). Both my wife and I have IRAs (403b), but not Roth IRA. We’ve held them for 6-7 years now. I want to convert these to ROTH IRAs. Is it possible to get the one time 10K withdrawl from those IRA accounts to pay down the 10% loan without incurring tax penalties? If you could email directly with an answer I’d appreciate it, and feel free to use this problem as fodder for a future post. That all culminated in the last 3-4 months and since then I have forked over money for a gym membership, stopped smoking :), made a concious effort to socialize with my friends, etc. and STILL have a big portion to hit my debt and retirement. I highly recommend the book “Get a Life: You Don’t Need a Million to Retire Well” by Ralph Warner. It mingles finances with actually preparing yourself personally for retirement. Think about how different your life would be if you could choose whether to work or not. Imagine you had enough savings RIGHT NOW to make a decision whether you’re willing to deal with Hell Boss or Arbitrary Deadline, or Stupid Coworker one more day. Imagine being able to sigh with relief and take a vacation if you get laid off instead of panicking about the mortgage. Forget about retirement, if that doesn’t motivate you — save for freedom and choice. Start now. That’s what I save for . . . not some distant day when I turn the magic 67. I found out that my mom, who is a public school teacher, has access to a 401(k) plan, a 403(b) plan, and a 457(b) plan. I’ve read that you can contribute the maximum to a 457(b) and also a 401(k) or a 403(b) (one or the other). Is that true? If so it’s a great way to save for late bloomers who happen to be public employees! Between that and my dad’s 401(k), plus the catch-up provision for being over 50, they could be saving somewhere around $60k per year! Plus more in IRAs I suppose, so about $70k. Unfortunately they have very little in retirement savings — about $150k, in my dad’s name only. I’m working on convincing them to start saving the maximum. Any advice? You simply can’t save your way to wealth because a little creature called INFLATION is always nipping at your heels! In fact, $1,000,000 in 20 years will produce the equivalent of $15k salary today. Great post, as was the one before on Compound interest (CI). I have written a number of times on CI and even though time is a big factor in it, better to start late than never. I’ve been working on making some financial changes this month and I have come to the realization that I am not going to meet all of the arbitrary goals that I set when I was a very optimistic (and broke) 20-something (like you, I am going to be 40 in the not so distant future). Still, I agree that it is never too late to redefine financial success. Here’s somethng most people, including myself, don’t think about. That is very true of my Dad, most of his growth in his stock portfolio has come after he retired. He also started saving at 57 and did quite nice. Having a defined benefit pension plan helps. That’s right, I think [email protected] fivecentnickel.com has covered it as he has both. I’m 19 years old right now and I’m well aware that when I’m 65, old age security will no longer exist. Which is evidence that the fearmongers at least are doing a good job of “educating” young people. While matching an employers contributions to retirement may make sense for some young people, the fact is there are far better things to do with money at that age than paying for their retirement. For most 19 year olds, their highest earning years are well ahead of them. Rather than saving, it makes sense for them to be going into debt to pay for things that will make their life better now and into the future. Sure when they are in their 30’s they will look back and regret they don’t have some of that money. But not as much as they would regret not having done the things it allowed them to do because they focused on paying for their years in a nursing home. That camera they “wasted” money to take pictures on their vacation will still be getting used, now to take pictures of their child’s first steps. Those pictures will likely be worth more in their retirement than the money they could have had if they hadn’t bought that camera. Too many of us wish we could set the clock back and make some profound changes. But we can’t, and there is something to being young and experiencing things for the first time. I’d recommend focusing on just a few things like: avoid stupid debt by asking if you really need something before you buy it, put a little of everything you make (even if it’s only $10 a week) towards the future and don’t touch it, and finally that if you want something (vacation with friends, travel abroad, etc.) be smart and save for it if you can and once you have, spend it and enjoy it. Hopefully you can have fun and positive experiences, minimize your unnecessary “stuff” (which only ties you down anyway), and have a start at savings without too much debt when you finally start to settle down. I know the biggest mistakes typically come at the end of college when suddenly you’ve got the job and you are listening to all the sales folks telling you you can afford it, and boy, do you want it. At age 48 I had NOTHING saved for retirement. When I thought about this and would have anxiety attacks I consoled myself by reminding myself that at least I had equity in my home. Of course we know what has happened with that. At about this time almost two years ago in 9-06 I received an offer from ING for $25.00 to open a savings account. Thus begun my start. I had to send in a cancelled check to receive the $25.00 so I decided then that I could afford to add $15.00 and begun a account at $40.00. However, small this was I had told myself at least I am starting somehere. I slowly added some money until I had about $700.00 to open an IRA in 3-07. I felt again that I was at least doing something and could say I’ve actually started an retirement account and I still had my home equity to help relieve my anxiety. I then decided to diversfy a little and opened a CD of $500.00 that July 07. A large part of this money was from coin change I put into two large casino cups over about 7 months. I figured I could at least put my change away and see how it adds up. Now, I have my house equity, my IRA account and a CD. With the ball rolling I then decided to add into my ING savings account and earn interest while I have back up money if needed for an emergency.. I continued to save more change and again able to put $200.00 into ING 1-08 and add into my IRA account which is now $1315.00 by 4-08.Then finally taking a look at my SSI projected income and what I figured I needed monthly to live on in addition to SSI was $700.00 At this time in 4-08 what I have saved already gives me a couple of months for retirement. Looking at it this way begins to have me feel I’ve started however small and can say I have some retirement for at least a few months. I then decide I can do more tricks or startegies to add to savings in addition to saving coin change I do this in my bank accounts. If the check is written for $55.10 I deduct $56.00 more change! I then put a $1.00 away everyday in another cup which gives me $100.00 in a 100 days. I then figured I can also save a $100.00 every month. In addition, I researched my insurances and saved almost $500.00 on auto and home. That goes into savings. Any refund tax rebate, property tazes, etc. goes into savings. Thus, I am now saving change from cash, bank accounts, increase my daily savings to $2.00 a day, $100.00 a month, and any left over money from my monthly budget. If I budget 100.00 for my electric bill and work hard to try to conserve and the bill is $90.00 I have $10.00 that goes into savings. I am self-employed and occasionally I am able to collect on past money owed to me which I’ve decided all this money will also go into savings and thus have been able to add in $150.00. In addition, I have decided that I can match anything under a $100.00 to put in. Thus, if I received $25.00 owed I can put $50.00 away. Now I have my house equity, a CD, an IRA and a savings account plus small stategies to keep adding. If I work on a Saturday when I really don’t want to my motivation is that money will go to retirement so I do it instead of turning it down. I am now researching mutual funds for investment. I also calculate the interest on my accounts and I can see even at a low rate it still adds money to use for retirement. I had a garage sale and made a little and this money goes to retirment. I now have in less than 2 years saved $6,000.00, and have my house and my SSI. At this point I figured I have at minimum one years worth of retirment and about 20 years to continue to work on this. I feel a little more hopeful. Panic still sets in especially when I hear how much is advised to have and have little I have in comparsion. But I have to realize a start is a start no matter how samll and is way better than doing nothing. I write this because I am completely overwhelmed by this and know others must be. It might seem silly to be saving change but it does feed on its self when you see how much can be saved and you start to branch this out into saving in other ways. One step in front of the other. I am also trying to pay off as much debt as possible. This will free up more money for savings and less needed at retirement. I figure today that if I can save actual change, change in checking, $2.00 a day (my normal cup of coffee), $100.00 a month (just like its a monthly bill and pay myself first), money left over from monthly budgets, any refunds/rebates, past owed money paid to me (that I already thought was gone) and motivation to work on weekends as my second job it will add up. I have also decided that for every day I work I can also give myself $5.00 as a reward and that goes into the bank. It can be done. Maybe this helps inspire others and/or you have your own small but inspirational tips that could inspire me. I am now 49 1/2 and see that I have at least one year of retirement that I was able to save for (not include considering my home equity) which helps eas some anxiety. I figured I have at leasat 15 years but plan on 20 years to continue the snowball effect. This will increase as long as I see that I can do something however samll.